The Register and Think Secret have posted that IBM is preparing a dual-core version of its 90nm PowerPC 970FX processor (known to us as the G5). It's Codenamed Antares, and the chip will be delivered (likely in sample form) to Apple later this summer. The chip, to be formally called the PowerPC 970MP, and is said to contain two 970 cores each with its own AltiVec/Velocity Engine SIMD unit and 1MB of L2, up from the 970FX's 512KB, but still without L3 cache support. The chip is said to clock initially at 3GHz with a 1GHz frontside bus, and rumor has it that Apple has committed itself to using the part. Apple will receive prototypes (samples) in August and the part is likely to be into production next January, again rumor, which would put its implementation probably a year from now or for a WWDC 2005 launch. 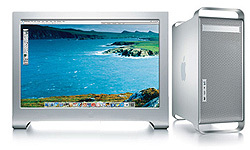 The unofficial apple weblog has posted what seems to be a rumor about an Aluminum clad cinema display.